This series of frames is taken from one of James "Doc" Counsilman's instructional films. The frame capture speed is not known. Frames #1 - #3: The entry is shoulder-width apart and the hands turn immediately to produce backward force. Frame #4: A strong arm-pull is developed through adduction of the upper arms. Since the upper arm rotates in the shoulder joint, the lower arms and hands will rotate outward not because of any mystical force property but because that is what the swimmer's anatomy dictates being done. The head rises even though it is under water. The reaction to that movement is a dampening of the hip-rise that results from the very quick but shallow kick. Frames #5 -#6: The arm pull is still strong. Adduction of the upper arms continues. It can be clearly seen that the propulsive surface of each arm is the forearm-hand combination. Frames #7 = #8: In frame #7 the benefit of adduction of the upper arms is at its limit and extension of the arms is initiated. Force is still applied by the forearms and hands. The head starts to rotate downward to counter-balance the dropping of the knees preparatory to kicking. Frames #9 - #10: Propulsive force is maintained until the hands exit. The downward kick causes the hips to rise slightly even though it also counter-balances the recovering arms. Another "secret" of Mary T.'s stroke is revealed in this sequence. Maintenance of a flat and streamlined body position is achieved better than in most swimmers. Using neck flexion to raise the head as the legs complete the initial kick, which subdues hip-rise, is novel. 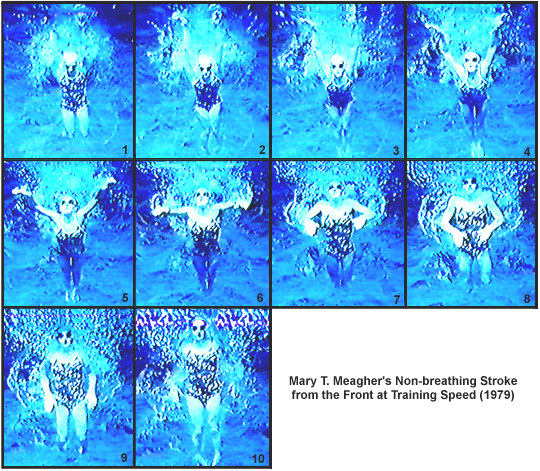 The length of time and immediacy of force application are once again emphasized as being a distinctive feature of this swimmer's stroke.